Sketching animals is not really my forte, but I thought I'd share my completed zoo sketchbook pages with you guys anyway. The only way you get better is with practice, right? So, here we go. OK so the first sketch was of a bonobo. This was first because it was the first really good place where I could sit and observe for awhile. Since I was with my friends and their children I didn't want to drag down their pace, so most of these are pretty quick. All of them are done with colored pencil. The bonobo liked to move, as many animals do (obviously), and I tried to catch that by drawing the limbs in a few poses. My favorite part of the sketch is the bonobo arm reaching up for the bar above. The face and all that is just a mess, but that's what happens when I decide to use colored pencils! The arm, though, is done correctly, just wildly out of proportion with the top torso. The Flying Fox was drawn in a sort of half-light--this was an indoor exhibit, and since these are nocturnal animals, the fox is hanging upside down, the wings enfolding the body. I tried to get the hard structural edges of the wings, and I think I succeeded pretty well. I knew I wanted to get the mandrill's face, since it's so colorful. This guy was very active, but I was able to get the basic shapes and the color variations on his fur. The flamingo is probably my favorite. They were out in full sun, and this one was quite obliging and stood still for awhile while I got the basic shape and did some shading with the feathers. I was going to color her in later, but one of the little girls I was with asked me to do it then, and I'm glad I obliged! This one was drawn inside, with light coming in from above, so I decided to do it in a deep indigo pencil and just get the outlines of the langeurs sitting on their beam. (There are a ton of ways to spell "langeurs" as I found out when I did an Internet search--this is how it was spelled on the exhibit sign). This started as a single line contour and then I went back in and drew heavier lines to differentiate the animals, with the one closest to me getting a bit of his facial fur drawn in. The other thing I need to remember next time is to bring the pencil sharpener! I'm working on prep for my first vacation with my sketchbooks, and I'm really excited. I think I've got my palette set. We're going to Colonial Williamsburg and the Outer Banks, so I need a variety of colors. I'm definitely going to be playing with mixes. I'll be doing some trip prep (Liz Steel inspired) sketches in my big book over the next few weeks. The snow is melting! The snow is melting! Really, I don't mind snow--around Christmas. I do mind it when it's crazy cold and I have to scrape off my car whenever I want to go somewhere, and deal with the ice around my car. But it's going to be 50 today, and almost 60 tomorrow! Yay! I'm glad about that 60 in particular because tomorrow is the Columbus Catholic Women's Conference, and last year a huge snowstorm kept me from getting there. It starts at 8, but you have to get there early to get a decent seat--and registration opens at 7. So that means you get up early. And getting up early plus dealing with snow? Just, no. But this year, no snow! No ice! Yay! I'm especially excited because Jen Fulwiler is one of the speakers. This week I went to my audiologist and got my cochlear implant (CI) tuned up. That's not the technical term, by the way. I hadn't been to see her in awhile, so I went it and we "reprogrammed" my processor. The big difference between a CI and a hearing aid is that a hearing aid just makes sound louder, while I CI helps you understand what the sound is. And if you're like me, and your hearing is basically shot, you need the CI, and not a hearing aid, becaus making sound louder won't help you. The cells in the cochlea have been destroyed, and thus the sound isn't getting processed correctly by my brain. Thus--the CI. An "array" was threaded into my cochlea during surgery, and that relays the sound I get directly to my brain, bypassing the broken bits. After we fine-tuned the programs (they're called MAPS, if we're being technical, but I forget what that stands for), my audiologist took me to the booth where they run hearing tests. If you are hearing-impaired, these booths are generally awful because you feel like an idiot. But with the new program, I was able to hear a really wide range of sound at various levels (meaning I detected the sound--I could hear it at all) of pitch and volume. So yay! The other thing about CIs? They're covered by insurance. Hearing aids aren't. I've been doing a TON of drawing this week. Bust out the paints and pencils! This is my Atlantic Puffin. I didn't get quite the result I wanted on the black parts, but I did it on watercolor paper, which has that grain. So, whatever. But how cool is this animal? Orange eyes! I'm also working on sketching and painting teacups. I need to take some pictures of those, though, to show you. Reading: Not a whole lot, sadly, other than my Lent books. But when one gives up book buying for Lent...also, the library hasn't had any interesting books on the ebooks roster lately. I love that you can borrow ebooks. No worries about returning things on time! This week in CCD we're doing Sacraments--we've broken them up into parts. 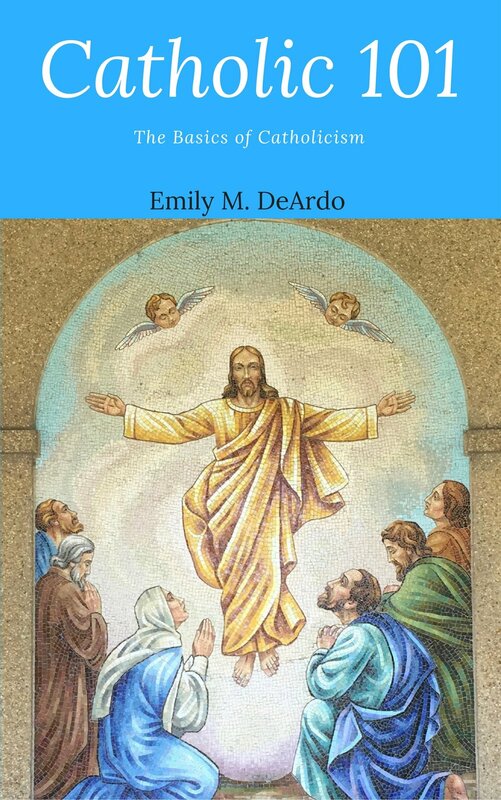 The book does a chapter on the Eucharist when we talk about Holy Thursday, so that's coming up. This week we're covering Baptism, Confirmation, and Holy Orders. Next week: Marriage, Confession, and Anointing of the Sick. Sunny, cloudy, and breezy. By "cloudy", I Mean we've got a few clouds floating around. So I guess that means partly sunny? I have no idea. My blue and white stripped breton top (short-sleeved) and my Boden skirt with the seaside print. I get more compliments on this skirt than anything else I own, so basically I have to keep it safe forever and ever. :) I'm also wearing my Charleston goldbug bee earrings. Sterling Road, by Cassie and Maggie. Today's the 11th, so I'm off to do Holy Hour as soon as I finish this. I'm part of the Summit Dominican's adoring rosary, so that means on the 11th of every month, I have a Holy Hour. (I chose the 11th because that's the date of my transplant) Last month, my holy hour was in Charleston. :) I'm taking a lot of intentions with me. Today is also the feast day of St. Clare, follower of St. Francis and foundress of the Poor Clares--Mother Angelica's order. Working on my Sketchbook Skool classes--I have to draw a piece of toast later today. :) I'm also working on a colored pencil drawing that I did in pen a few weeks ago. I'm adding the color now and trying some new techniques. We'll see what comes of it. It's the master bath's week for deep cleaning so I"m working up there. It always amazes me how many dishes I manage to go through as one person. Really! This week I'm doing a series on Dominican saints, and tomorrow St. Thomas Aquinas is up. So far I've done St. Dominic and St. Catherine of Siena. It came to my attention over the weekend that not too many people are familiar with the Dominican saints, so I'm going to try to rectify that. I've also got two September Real Housekeeping pieces being edited. We haven't come up with our October topic yet, so I'm waiting to see what it is before I start brainstorming ideas. I'm also playing around with a new idea for a novel that will be my 2015 NaNo piece. In the brainstorming stage now. Yoga yesterday, gym today--after Holy Hour. I'm sad that this summer has mostly been too cool to go swimming. I often joke that I was born in the wrong century. Not medically--in any other century I'd be dead--but socially. A lot of my skills are in the old-school definition of 'accomplishment', as Bingley talks about in Pride and Prejudice (and which we will be talking about on Thursday in the Jane Re-Read!). I can cook, knit, sew (cross-stitch and mend), play the piano, sing, etc. I certainly have the extensive reading down, but I've never been able to draw. Really. My brother could do it, and my grandfather, but not me. Art class in school was never a subject at which I excelled. As I got older, I thought I'd never be able to learn it. But then Melissa turned me on to Sketchbook Skool. This is an online art school, taught by professional artists and teachers. It's video-based, and each class lasts six weeks. I enrolled in "beginnings," and I'm in my last week of the course. I have definitely learned to draw! Anyway, yes, I am really happy with the progress I'm making. The classes have been so informative and I love the teachers. I'm enrolling in another class next week, because in 'beginnings' we haven't covered everything. We've done watercolors, pen, pencil, colored pencil, and we've learned a bit about technique, but I really need to work on perspective and depth in my drawings. There are times when it's really frustrating--don't get me wrong. Some of my drawings are much better than others. But I see something good in every piece I do, so that's definitely a step forward. SBS is a great example of how the Internet can be awesome. I never would've tried to do this if I hadn't gotten the recommendation from Melissa, and I never would've found these great teachers. I can move through the classes at my own pace, right tin my house. It's not something I have to leave my house to do, which is nice.